Decription: A MALTI-POO is a MALTESE and POODLE cross that may demonstrate any combination of traits from those 2 breeds.The MALTI-POO has become very popular in the last few years. They play a big role in the current designer dog trend. 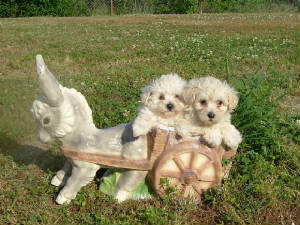 MALTI-POO'S are sweet ,loving, energetic dogs. Color: Color will vary from poodle parent, grey, black, white, and apricot. Coat: Malti-poo's have fine,frizzy,wooly . Temperament: Intelligent, friendly, loving, loyalaffectionate family dogs. Special Skills: Used mostly for a therapy dog. 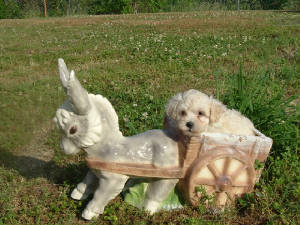 Care and Exercise: Malti-poo's have low-shedding, low-dander coat dogs. Shampoo once a week and daily brushing is essential.